Beer bought from the shops never quite hits the spot that a pint poured down the pub does. 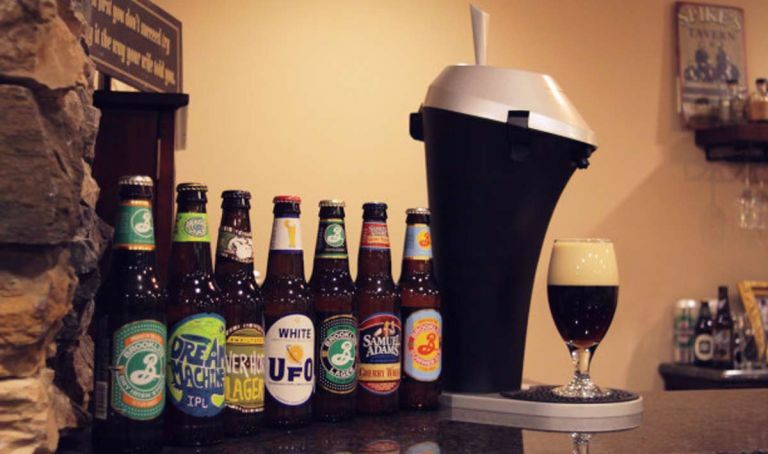 But that could all change with this new device that turns cheap booze into craft ale. Called Fizzics, this devices sits on a worktop and uses high-frequency sound waves to oscillations to create a decent head on your humble pint. A bottle or can can be put inside the machine, a tube inserted and the top closed. All of which reminds us, so far, of a SodaStream – that pop-making gadget beloved of seventies and eighties children. When in the device, the beer is pressurised and oscillated and ready to pour using the tap on the top of the machine. Pull it forward to pour and the backwards to create the head using sound waves. The resulting head should last a lot longer than the one that comes from just pouring out the beer into a glass as the device produces smaller bubbles. According to the makers, cold beer works best with the device. Not only does the Fizzics machine work with cans or bottles, it will also work with bigger kegs. “Fizzics was engineered for your five senses and delivers visually appealing head, wonderful aromatic bouquet, and sensual liquid and foam mouthfeel making for an authentic, true representation of an expertly poured pint,” said the manufacturers on a crowdfunding site. The Fizzics pump will set punters back £130, but the maker's Indiegogo campaign is offering the device for £80 for early backers.